Once in awhile an invitation comes over the transom (or, in this case, the ether) that feels like winning the lottery, or indicates that your karma is enjoying an attack of the happies. In this case the kind offer was made by Brian and Clare, the hard-working stewards of Big Table Farm, to come out to their 70-acre spread in Williams canyon near Gaston. The occasion was Easter dinner and a tour of their property and critters, which to me is the equivalent of having Christmas, a trip to Paris and a litter of puppies magically fall in my lap on the same day. Though my husband had come down with an unfortunately timed head cold, my brother and his bride were also invited, so we piled into their brand-new Mini and drove out into the wilds of Washington Country. We turned off the two-lane highway onto not one but two dirt roads till we spotted the telltale pink Victorian farmhouse on the canyon's steep sides, and pulled up to be greeted by the lovely Clementine, their Catahoula Leopard Dog. 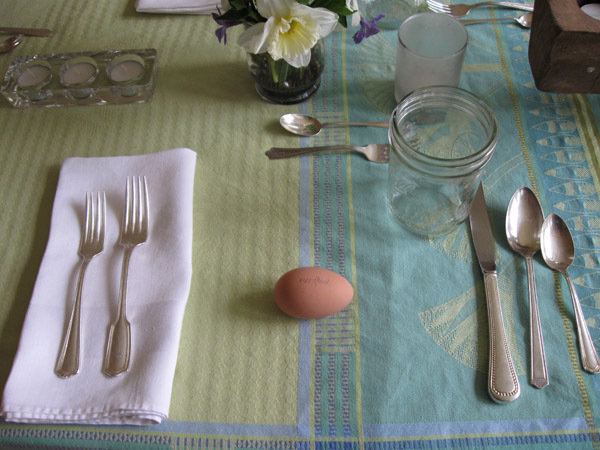 We got back to find the eponymous Big Table in the dining room set with a beautiful collage of old silver, mason jars for water and an egg at each place that, when we sat down and read each one in turn, was a praise poem for spring. Then the food started coming, beginning with Brian's incredible homemade homemade ravioli stuffed with ricotta, caramelized onions and pine nuts with sage butter.